There are essentially six ways, when put together, you can land a new client on that very first call. But one of them is something very few Virtual Assistants do. And yet, it’s highly successful. However, before we get on to this ‘golden nugget’ let’s outline the other five steps that you must do, and hopefully are already doing, on each new business call. We’ve talked about this before in our article on overcoming first client consultation nerves, but it’s one to reiterate. And by research, I mean on the potential client, on their business, on their online activity, on their target market and on their competition. If you’re well informed and knowledgeable beforehand, not only will they be impressed, you’ll feel so much more confident for that first chat. Briefly introduced in step one, confidence will, in part, come from thorough research and being prepared. But it’s also something you should work on building yourself. You may be a confident person naturally, if so, you’re fortunate. Use that confidence to your advantage during client calls by taking charge, being forthcoming and advising them what they should do next. If you’re not naturally confident, there’s no need to worry. You can build your confidence up. And the best way to do this, is by receiving positive feedback from existing clients. If you’ve not had any paying clients yet, offer to do a free job for a friend or family member in exchange for honest feedback. The more positive feedback you receive, the bigger the boost to your confidence. Oh and one other confidence boosting mechanism … being sure of your skill set and what services you offer. If you know you’re good, that will come across on client calls, no matter how nervous you may feel. 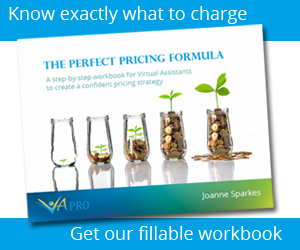 Being personable should come naturally to all VA’s out there – after all, your job is to liaise with clients regularly. So being personable is part and parcel of that. The reason I’ve mentioned it today, is because the point above – being confident – can sometimes overshadow being personable. To the point of arrogance. So just make sure your personality doesn’t slip away when displaying how skilled and capable you are. A great way to bag a client on your first call is through your business offering. For example, once you’ve covered their support needs and you’ve provided examples of your experience and skillset, lay it out for them – what you think the next step is. Remember, that person or business may have never worked with a VA before, so you directing them and explaining how your other clients have decided to hire you long-term, may give them the nudge they need to stop looking elsewhere. Of course, some clients may not like being pushed into anything so soon. And that’s fine. You’ll most likely get a vibe off them on the call as to whether this line of persuasion will work or not. Just as important as all the steps previous, send a summary of the call immediately afterwards – so they know you’ve understood their support needs and what your offer is. And follow-up again if you haven’t heard anything within one week – maximum. Following-up does not show a sign of weakness or need, it shows professionalism … when done correctly. And there you have five of the essential steps to land a client on your very first call. But what about that ‘golden nugget’ … the one that’s a sure-fire way to hook them in? In the steps outlined above, this would naturally slot in before step four – explaining your working style – and is the MacDaddy of client conversions from the very first call. Dish out some advice for free. So say for example, they’ve come to you searching for a VA to take over their blog and social media because they know a) it’s the foundation for receiving more traffic to their website, b) it will help reach a wider audience, and c) will portray the person / business as an authority in that industry. Knowing this is one of their major support needs – what can you offer them of value on that first call that could help them immediately? Something they could take away from that call, and get on with, that will help their business without hiring a VA.
Perhaps you’ve looked at their blog and can see that the headlines aren’t particularly captivating. Or their social media profiles are all broadcasts and no interaction. Give that potential client specific examples of what they could do themselves now to benefit their business – a better headline idea, an example of how one of their competitors engages on Facebook, etc. Anything at all that gives them value on that very first call without paying a penny. I assure you, this is not counter-productive. You’ve shown expertise. You’ve shown initiative. You’ve shown a desire to help their business. Who else would they want supporting them? I think free advice should come naturally to a VA also, as we are out there to help people. By holding back, we are encouraging scarcity in our own work – not good for karma. Thanks Elaine. I agree that free advice should come naturally to VA’s, but all too often it doesn’t. Many VA’s don’t realise the expertise they have – particularly those just starting out – or, feel equipped to be more forthcoming. In fact, the term VA is too nondescript, we’re Business Support Professionals – perhaps if we all think of ourselves in that way, we’ll feel more capable of speaking out and adding real value.